Situated on the right bank of the river Malaprabhā in the Bijapur district of Karnataka State, this little village has carved out for itself a very important place in the archaeological map of India. A large number of Hindu temples built of stone, but now in ruins, is located in and around this village. They belong to the period A. D. 500-650 and were built by the Cāḷukyas of Bādāmi (A. D. 500-757). There are reasons to believe that human settlements existed here even in the 7th century B. C. By A. D. 700, it had grown into a big city, famous not only for trade and commerce but also for the settlements of learned brāhmaṇas. The old temples, about 125 in number, have been divided into 22 groups depending upon their special features. Among these, the Durgā temple, the Lāḍkhān temple, the Huccimalliguḍi and the Meguṭi temple are more famous and have provided a lot of information regarding the history of the development of Hindu architecture. There is a temple dedicated to Brahmā too. 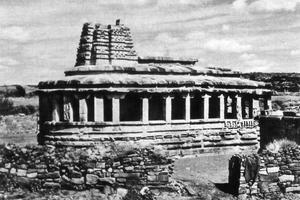 Though all the temples are in ruins, only in the Rāmaliṅga temple, worship is continuing even today. The village has a fort and also three cave temples. A number of inscriptions belonging to different periods (A. D. 700-1200) have been recovered from the various sites of this village.